Are you hosting a luau that you want to make your own homemade invitations to send out to all your friends and family. Whether it be a beach party in your backyard or near the surf, make sure your invites set the right tone for the party. Lets explore some luau theme ideas to really make our invitations stand out and make a solid impression. Think outside the square and send your guests a message in a bottle. Roll up your invitation and pop it into a small bottle with a little sand and glitter in them. I made these invitations on my computer in Microsoft Word with some clip art images from the internet see more details on my Blues Clues Invitations. 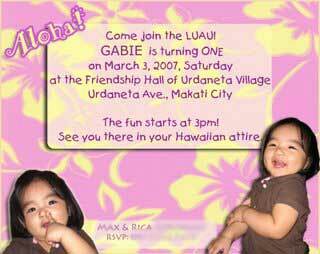 This invitations was by Max and Rica for their daughters first birthday The background is of some beautiful flowers on pink. I love the photos that have been added. this is a nice touch and they look great!